Jeff Fiedler, director of the Cavaliers, filled us in on his drum corps background and answered a couple questions heading into the 2004 season: I saw my first drum corps show in 1967 or 1968 (I was pretty young) -- VFW State, Ill. I remember going to LaFollete park in Chicago in the mid-'60s and seeing the Cavaliers, the Milstadt (Ill.) Crusaders and other corps performing an onstage concert. My cousins were in the Crusaders, they were in drum corps before me, that's how we (my family) got involved. Funniest thing is that my relatives (cousins and their family) despised the Cavaliers -- they always lost to the Cavaliers. 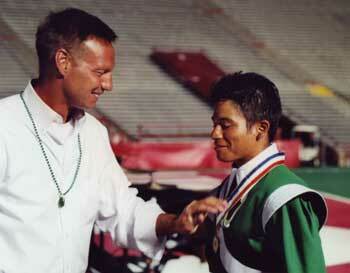 Jeff Fiedler (left) gives a World Championship medal to a Cavalier in 2002. Photo by Johnny Gilbert. Blue Devils 1976 finals Those are my standards, I'm sure I missed some tremendous performances along the way being a member warming up somewhere during a show or being a director making sure the Cavaliers were ready to go. My own personal favorite peformance: Finals 1980 -- seems like yesterday ... DCI.org: How do you keep yourself musically and visually current? What do you watch for ideas? Fiedler: I attend as many Chicago Symphony Orchestra concerts as possible. I will attend performances of things like Blue Man Group, Stomp, Shockwave, American Ballet Theatre. I try to attend concerts and performances through the fall, winter and spring -- when time permits -- of some of the best youth and adult performance groups in the world. I remember about 10 or 12 years ago winding up with a ticket to see the Bolshoi and the Kirov ballet companies on tour in the United States. It was one of the most captivating and stunning performances I have ever seen. I've visited and revisited some of the major art museums in the world. I'm fascinated by architecture and design. I like to watch great musicians and conductors (professional, college and high school) at work and listen carefully to what they say and do. I'll wind up watching and listening to rehearsals and concerts late at night on the Arts channel with Bernstein, Stokowski, Barenboim, Solti and Reiner. DCI.org: Any ideas for which direction the Cavaliers will head visually in 2004? Fiedler: We'll go forward, backwards, left and right, up and down. DCI.org: Describe what you think a Cavaliers' show will look like in 2015. Fiedler: Wow -- I'm still working on 2004. Ask me in a few more years. I think I can guarantee we'll be wearing green, black and white!